A Singh, M D’Alessandro, S Kao, Y Sato. Vein of Galen Malformation. The Internet Journal of Radiology. 2008 Volume 10 Number 2. We report a case of vein of Galen malformation presented at birth with congestive heart failure with subsequent discussion about this rare anomaly. A newborn male was referred for evaluation of congestive heart failure. He was the product of a Cesarean section done at 34 weeks. 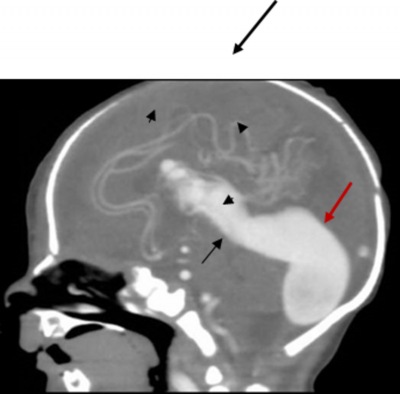 Prenatal ultrasound revealed multiple tortuous intracranial vessels. Figure 1. 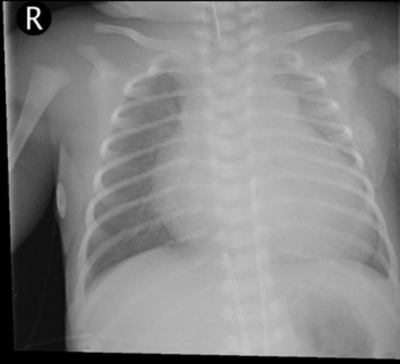 Chest X-Ray AP view showing cardiomegaly with prominent vascular markings. Echocardiogram at birth showed moderate tricuspid regurgitation, patent ductus arteriosus with right to left shunt, and a dilated aorta. CT angiography was done for further evaluation. On CT, an enlarged primitive median prosencephalic vein was seen continuing in the falcine sinus with dilated bilateral transverse sinuses. Multiple arterial feeders were also seen draining into the enlarged median prosencephalic vein. Figure 2: CT angiography axial image showing enlarged median prosencephalic vein ( large arrow) with multiple arterial feeders ( small arrows). 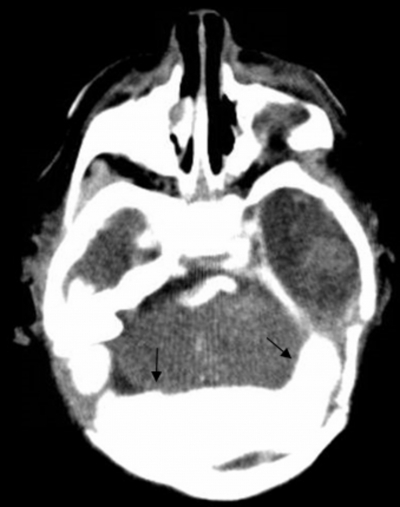 Figure 3: CT angiography sagittal image showing enlarged median prosencephalic vein (black arrow) continuing in the falcine sinus (red arrow) with enlarged confluence of sinuses. 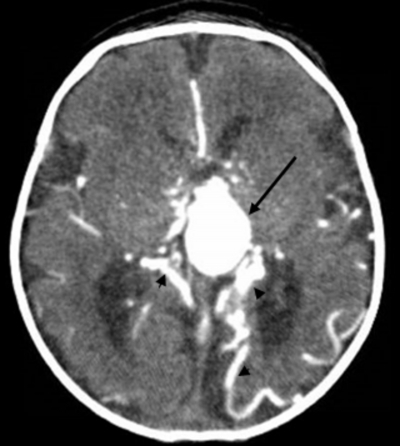 Figure 4: CT angiography axial image showing bilaterally enlarged transverse sinus (arrows). Diagnosis: Vein of Galen Malformation. The vein of Galen malformation (VGM) represents 1% of all vascular brain malformations. It develops from arteriovenous fistula between primitive choroidal vessels and the median prosencephalic vein (MPV). The abnormal flow through this fistula retards the normal involution of the MPV, which is a precursor of the vein of Galen. Therefore, the vein of Galen malformation is a misnomer as the vein of Galen is not formed and it is the median prosencephalic vein which is dilated. The MPV drains into the sagittal sinus usually via a persistent falcine vein and the straight sinus is absent 12 . VGM is classified into two types: choroidal and mural. The choroidal type is more common and characterized by feeder arteries from the anterior and posterior choroidal, distal pericallosal, and thalamoperforating arteries that join and then drain into the MPV. The mural type is characterized by feeder arteries from the posterior choroidal artery and supplying the wall of the MPV 2 . Clinical features depend on the extent of high flow shunting and the amount of venous outflow restriction. Patients with the choroidal type malformation are usually identified at birth with high output congestive heart failure, lactic acidosis, macrocephaly, and hydrocephalus. Patients with the mural type malformation may present later in childhood with hydrocephalus, developmental delay and ocular symptoms 2 . Prenatal diagnosis of VGM can be made using ultrasound. The characteristic finding is a midline tubular anechoic structure superior to the thalamus, which is contiguous with the dilated sagittal sinus (comet tail or keyhole sign) 3 . Doppler evaluation is important in differentiating this lesion from other cystic lesions of the brain because this is the only lesion that clearly displays blood flow within it 4 . Contrast enhanced CT scan and MRI demonstrates the enlarged MPV in the tentorial incisura with intense enhancement. Other findings are multiple tortuous feeding arteries, diffuse or focal narrowing of the falcine sinus or straight sinus, and parenchymal calcifications. Contrast enhanced CT may show a target sign in thrombosed aneurysm with a central non-enhancing part and peripheral enhancement in granulation tissue 5 . MRI is better than CT for VGM as arterial feeders are better identified 6 . Conventional angiography defines the extent of aneurysmal dilatation and demonstrates small feeders supplying the fistulas. It also gives information about the dynamic aspects of the venous drainage of the normal brain and hemodynamic relationships with the venous drainage of the arteriovenous shunt 67 . Conventional angiography is considered in those patients who are candidates for surgery or embolization. 2. Larson TC III: Cerebral Aneurysms and Cerebrovascular Malformations. In: Haaga JR, ed. CT and MRI of the Whole Body. 5th Ed. Philadelphia: Mosby Elsevier, 2009. pp 280-284. 3. Sepulveda W, Platt CC, Fisk NM. Prenatal Diagnosis of Cerebral Arteriovenous Malformation using Color Doppler Ultrasonography. Ultrasound Obstet Gynecol 1995; 6: 282-286. 4. Pilu G, Falco P, Perolo A, et al. Differential Diagnosis and Outcome of Fetal Intracranial Hypoechoic Lesions: Report of 21 Cases. Ultrasound Obstet Gynecol 1997; 9: 229-236. 5. Chapman S, Hockley AD. Calcification of an aneurysm of the vein of Galen. Pediatr Radiol 1989; 19: 541-542. 6. Seidenwurm D, Berenstein A, Hyman A. Vein of Galen malformation: Correlation of clinical presentation, arteriography and MR imaging. AJNR Am J Neuroradiol 1991; 12: 347-354. 7. Horowitz MB, Jungreis CA, Quisling RG, Pollack I. Vein of Galen Aneurysms: A review and current perspective. AJNR Am J Neuroradiol 1994; 15: 1486-1496.